Cache at Union Creek in Copper Mountain CO Real Estate is the newest built complex in Copper Mountain. Built in 2007 the Cache at Union Creek has 27 units comprised of 9 – one bedrooms, 12 – two bedrooms, and 6 – three bedrooms units. The one bedrooms are all 637 square feet and have a parking space, the two bedroom units range in size from 996 – 1155 square feet and some have detached 1-car garages, the three bedroom condos are anywhere from 1554 – 1621 square feet and come with either an attached or detached 1-car garage. Each property has in-floor radiant heat, a well appointed kitchen with granite and stainless steel appliances, in unit washer/dryer, as well as an oversized deck which is plumbed with a gas line for individual gas grills. Owners and guests at the Cache at Union Creek also have access to an oversized outdoor hot tub. Walking to the slopes from Cache at Union Creek is a breeze as you are steps from the American Flyer Lift in Center Village and High Point Lift and Kokomo Lift in Union Creek. Nearby in Center Village you can also enjoy a cup of coffee, a meal or a night out on the town at one of Copper Mountain’s many restaurants and bars. Copper Mountain also hosts many summer and winter events in Center Village which is just a few minutes away from Cache at Union Creek. 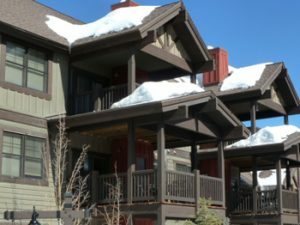 Being located close to the action yet in a peaceful, secluded area in Copper Mountain is what makes Cache at Union Creek an exceptional property to consider purchasing when looking for a Copper Mountain condo. Arrange a private showing of Cache at Union Creek properties and additional condos for sale in Copper Mountain CO Real Estate with us today.